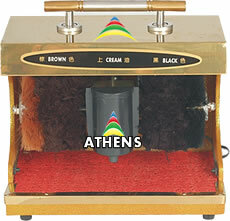 Athens shoe shining machine is the Hassle free way to clean your shoes in quick time. We supply well shaped and well equipped shoe shining Machine chennai which helps us to clear all the dust and dirt from the surface of the shoes. Our Shoe Shining Machines toils well and works longer. It has moderate rate which can be access to all our customers. Withing 15 seconds our shoe gets perfection. So, if you use it, you will give witness and promote others as well.